Marking the over 45-year- old development cooperation between Sri Lanka and France, the Government of French Republic agreed to extend its assistance to Sri Lanka by providing a euro 13.9 million (approximately Rs.2,514 million) concessional loan for the implementation of Development of Six Mini Dairies Project. The proposed project will include complete modernization of the pre-selected six mini dairy cooperative societies and organisations by establishing state-of-the-art equipment chains to produce pasteurized milk and sterilized milk at a capacity of 4,500 litres per day. The high-quality equipment will allow stable, homogenized and high-quality products with computerized monitoring. In addition, in order to improve the breeding process, a French non-profitable entity will extend technical assistance to dairy farmers; it will also carry out a proper market survey on the dairy sector of Sri Lanka. It is also expected that this initiative will support the government’s ambitious target to achieve self-sufficiency in dairy production by 2020 and to contribute to closing the gap between the demand for dairy and local supply. Finance and Mass Media Ministry Secretary Dr. R.H.S. 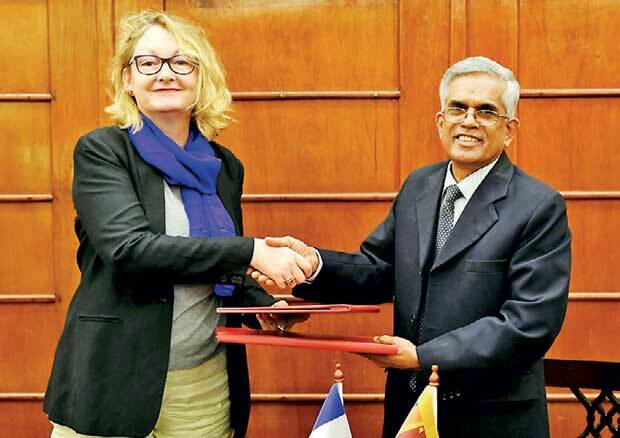 Samaratunga signed the relevant protocol agreement on behalf of the Government of Sri Lanka and Embassy of France in Sri Lanka Chargéed’ Affaires Isabelle Miscot signed the relevant agreement on behalf of the Government of French Republic yesterday. Embassy of France in Sri Lanka Economic Counsellor Hervé Sarnelli also participated in this event held at the Finance and Mass Media Ministry.